…attached are a few more drawings I did from the pictures Brian sent & the latest Tokion (Winter 08) cover with Olaf. 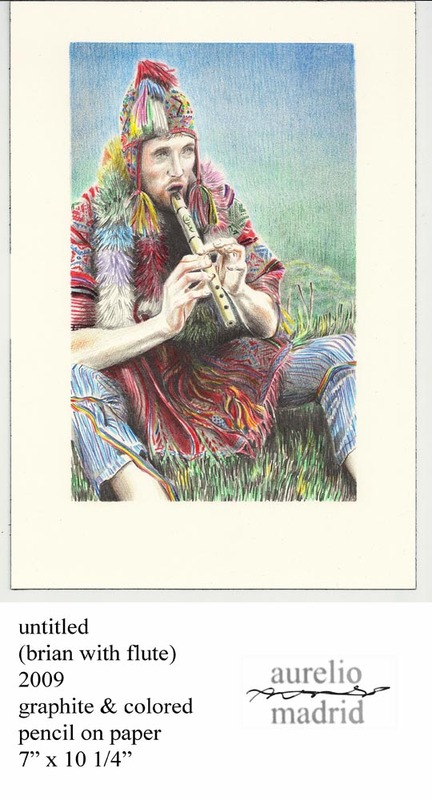 I love the picture (& drawing) with Brian playing the flute in the Andes (? 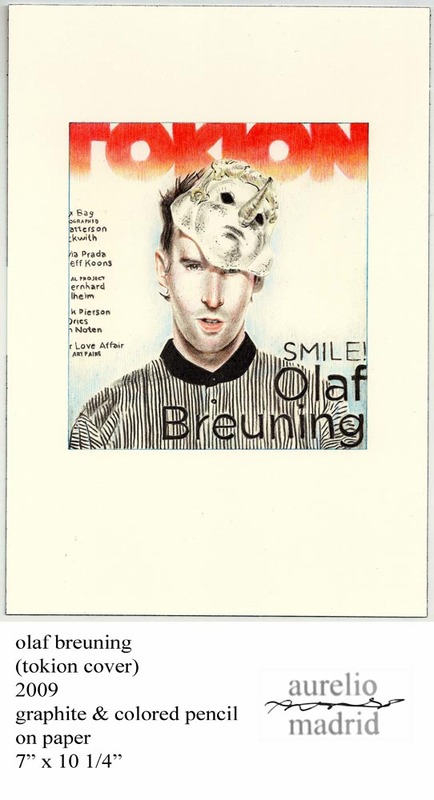 ), this is the 1st image I noticed of Olaf’s work a few years ago in Artforum. I also really liked the Tokion cover (picture & drawing). I was sitting at my local book-store (reading magazines, as usual) & I looked up & noticed Olaf’s face from across the room. 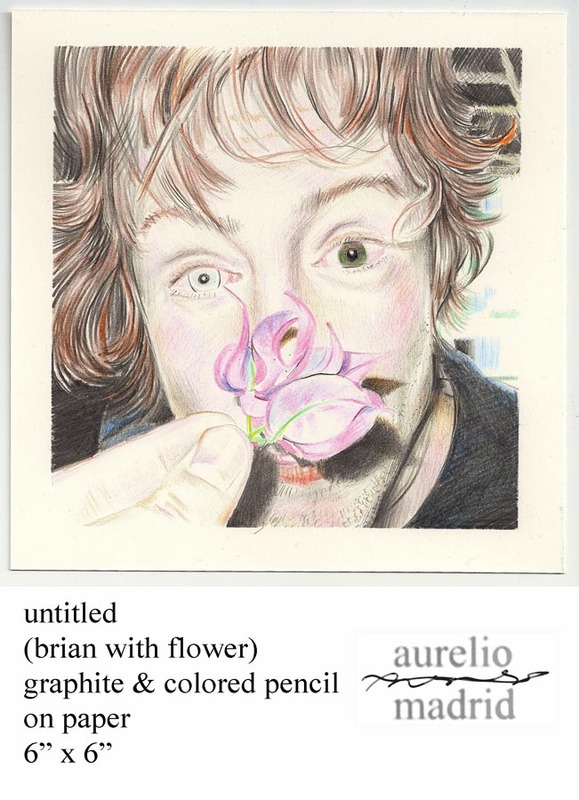 Given that I’ve been working on this little suite of drawing’s that featured Brian as the subject (Olaf as the photographer/artist), it seemed perfect to use this image of Olaf. 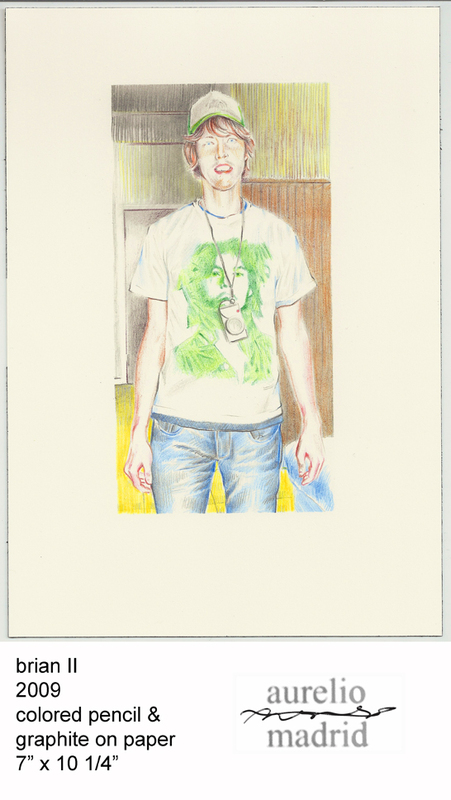 I’m seeing these drawings as a collaboration between both of you & me (along with Tokion) with a strong “appropriation theme.” Without getting too theory-heavy, I have been influenced here by appropriation art of the 80’s, Sherrie Levine, Richard Prince, & Jeff Koons to name a few. These little drawings are like doppelgangers of the originals, or perhaps they are like clones. Clones with different lives, other intentions lived out in the thoughts of people who will look with open minds. The drawings are separate yet intrinsically tied to the “originals,” in a way that’s unlike the original intent, Olaf’s intent. I also like the questions that arise when considering the work. Where’s the originality? Is this art, or mere copying? Is this plagiarism, or homage? Is this parasitical or simply a representation of my interest in the art of other people, re-authored by me? I know both of you are really busy, thanks for all you help & thank you very much for your help with this crazy project. p.s. …Borges wrote a story of Menard who rewrote Don Quixote. Menard’s Quixote was a refreshed palimpsest to the original, not merley a copy, rather an invigorated perfect likeness. This also reminds me of Allen Ruppersberg who is known to have copied Thoreau’s Walden onto paper, by hand &c…. This drawing is taken from a recent picture sent to me by Dana Holland (an assistant Professor of Social Science at AUAF in Kabul, Afghanistan & Sammy’s sister-in-law). I was instantly struck by the subtle poignancy of this image, the man’s possible blindness, his simple yet profound chore. 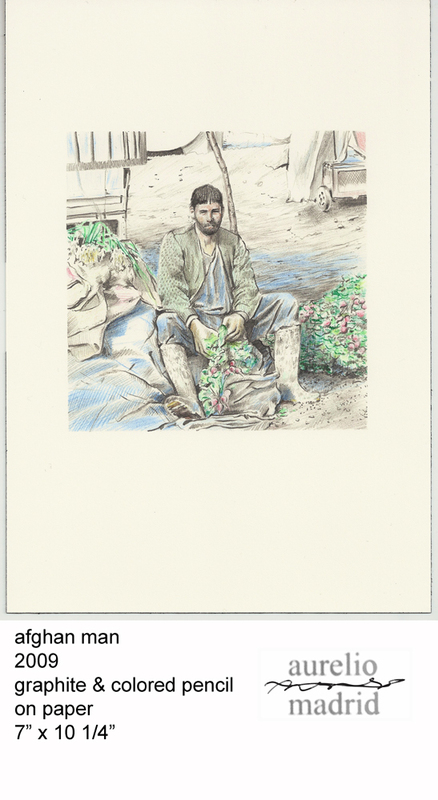 He appears to have just picked the radishes he’s sorting, getting his mind on what’s next, or what has been. Maybe he’s a farmer or just someone working for a farm. Who knows where his mind is while he works, while Dana passed by & snapped his picture, while I draw him. Most of the time I was drawing him, he was probably sleeping, resting & dreaming. His work will be complete when someone pays-for, cooks & eats his radishes. He’s working to feed people, perhaps because he can’t see enough to do more, perhaps because this kind of work suits his temperament. I’ll never know. I’d be curious to know what he’d think, if he knew someone in the United States had drawn his portrait & was contemplating his life. He seems to be a good, honest man & I wish him well.